Water Clarification - cfm - Wisconsin supplier of Erosion Control Products, Straw Blankets, Geotextiles, Silt Fence, Drain Tile, Polymer, Silt Sock,Gabions, and more! 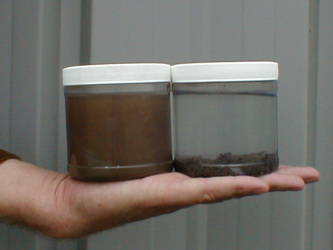 CF500 is a water clarification polymer capable of removing suspended solids from water. This polymer will have uses in nonpoint source pollution reduction and removal of total suspended solids from storm water retention and detention basins improving sedimentation. CF500 formulations consist of a polyacrylamide polymer and additives to aid in the formation of a floc. These additives include inorganic coagulants and hydration aids. **Requires specific permits from your local permitting agency.